The starter packs are designed for convenience and economy – they include everything you need to make whipped cream in a single package. This item contains 96 x 8gm cream chargers and a 0.25L whipped cream dispenser. This small cream dispenser is available in a choice of colours. The small size (1/4 litre) make it extremely portable and light. Just getting started? Then this is the package for you - our best seller 96 cream chargers with a cream whipper included for dispensing Nitrous Oxide into fluffy cream. The starter pack includes standard sized cream chargers (x 96). 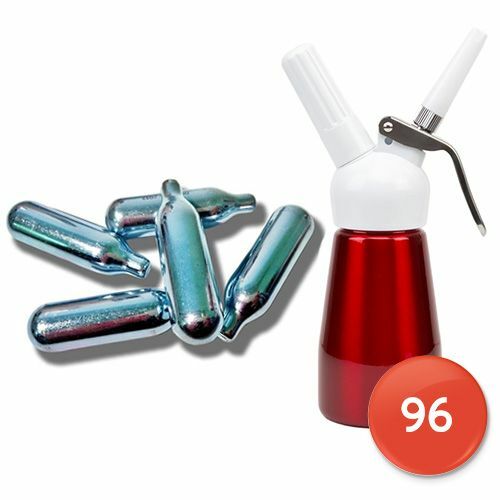 These are high-quality and guaranteed to be filled with 100% Nitrous Oxide. The premiums chargers are filled in German plants and are quality checked for both purity (no residues) and are electronically weighed to ensure that they contain the full amount (8gm) of Nitrous Oxide Gas. If you are used to manually making whipped cream for desserts then you will be pleasantly surprised at how easy it is to create cream using a whipped cream charger. The no hassle method (detailed below) uses nitrous oxide rather than air to aerate the cream. The result is a whipped cream that is both lighter and tastier that you are used to. An added advantage is that the nitrous oxide from the charger refill also has the property of increasing the shelf-life of the whipped cream by over a week – adding to the economic argument for cheap cream chargers. Add the required amount of cream to the dispenser – do not over fill. Assemble with the head and body by screwing in a clockwise direction. 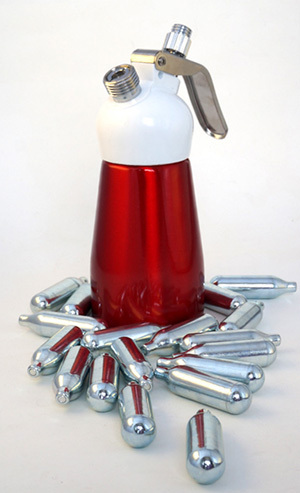 Incorporate the nitrous oxide into the cream by screwing down the holder and piercing the cylinder. The cream and the gas will combine inside the dispenser and are content to remain together until needed. The Cheeky Monkey likes you to get the most from your new cream chargers so why not get a bit experimental and have a go at this deliciouse tropical recipe which help bring the summer to you even when it's cold outside with no kind of atmosphere! Mangoes are all time favorite to everyone, it’s a fruit that tastes yummy and also creates a flavor unlike any other. Various recipes have been made with mangoes such as cakes, puddings, pies and so on but all of that have become boring now and you want to gift your family something new and delicious but not finding the right decision. Then ease your mind as the creamy mango recipe will give you the solution for this and help you serve any dish with a mango flavor that’s great to eat. Sugar or honey, preferred to your own taste. If sugar then one and a half cup would be perfect, else you can use two tablespoon of honey. One of mango juice, you can also slice the mangos and blend it to get a smooth mango squash and use half cup of it. Mix it all up in the cream dispenser, using nitrous oxide from charger shake it up and produce your own mango whipped cream, also known as creamy mango. Roasted chicken, tropical fruit item, cakes of different types or with any other possible item of your choice can be presented with the creamy mango. You need to be creative and think out of the box while you wish to present a mesmerizing dish, allow your own imagination to take over on your dessert ideas. You can generally keep the creamy mango refrigerated inside the dispenser for about 14 days but if you wish to extend the time then find a sealed box that is airtight. Pour all the cream in the box and air seal it, you can keep the cream then for about a month.